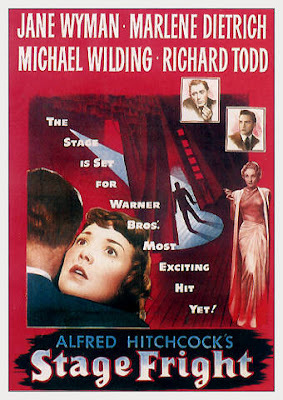 Alfred Hitchcock's Stage Fright (1950) is quite frankly a masterpiece. It's Hitchcock's tribute to his homeland (England) and it is a great suspense with a brilliant twist. Now, before I begin this semi-semi-review I must warn you there is a large controversy surrounding part of this film. When I address it I will give you a spoiler alert, as it truly gives away the plot of the film!!!! Her: Whoa, that's the husband [Elizabeth Taylor's] that died isn't it? 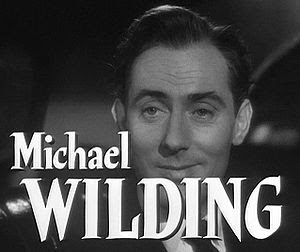 Me: No, it was Michael Todd who died...this is Michael Wilding. Her: Wow, so two of her husbands are in this movie! Her: I thought you said she was married to Michael Wilding? Me: She was. 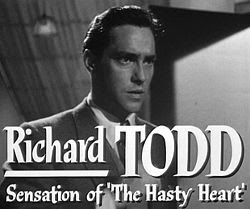 But she was NOT married to Richard Todd...he is completely different. Her: So Michael Wilding was the husband that died? Me: No, Michael Todd died in a plane crash! She divorced Wilding. Her: So, Richard Todd died in a plane crash? And this continued on throughout the whole movie. Hahaha, she isn't normally so slow or scatter-brained, but there is something about the Mr. Elizabeth Taylors that completely confuse her...LOL! 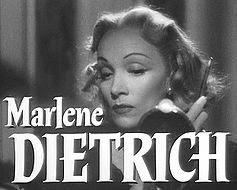 Marlene is fantastic in this film. She gives a complex and fascinating performance. Often hiding her character's emotions from view, until they suddenly pop up again (okay, that sounded strange...hahaha). It gives her performance many layers...completely mesmerizing! 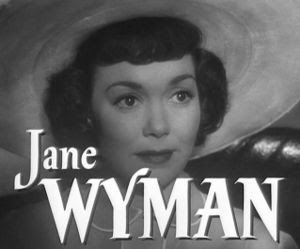 First, the good news: this is definitely my favorite Jane Wyman performance. 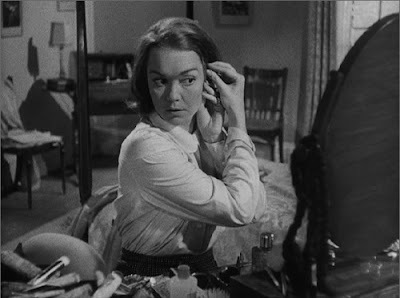 Now, the bad news: I don't like Jane Wyman very much. This is strictly as an actress. She often drives me bezerks! Her screen persona, just annoys me. And I really don't think she was right for this role (she is supposed to be born and raised and lives in England, also her parents are both English, yet she has an American accent)! 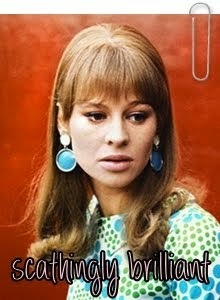 However, she did great in this role. Maybe not the best choice, but still an alright choice for the part. Genius. Pure genius. His performance was beyond perfection. The second best in the film (the best is coming up). His portrayal was amazing. To say anymore might give something away, so I won't. 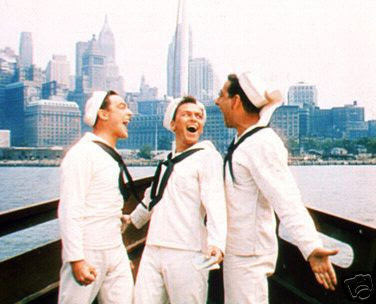 But, if you have seen this film, you know what I am talking about! 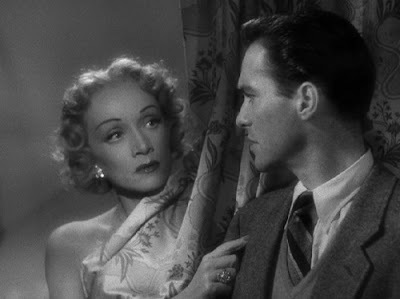 Wilding was excellent in this film! It is too bad his part wasn't bigger. And plus he's just adorable with his darling British accent. 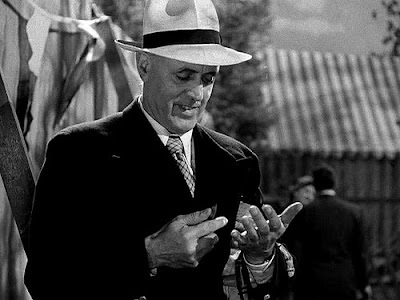 The best performance in the whole film goes to Alastair Sim, who completely walks away with the entire movie. Sadly I could not find his own credit, so this still shot will have to do. It is from an absolutely hilarious scene, where Alastair needs a little blood for something...fast! He ends up stabbing a bit at his hand to get a little blood...it sounds morbid, but really it is hilarious! I could go on about his performance in this film forever that's how brilliant he is! 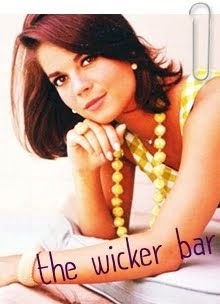 And, Patricia Hitchcock is delightful...as always, playing the bit part of Chubby Bannister. She seriously lightens and brightens up absolutely anything she is in! Also, Sybil Thorndike is fantastic as the slightly dotty mother of Jane and wife of Alastair. 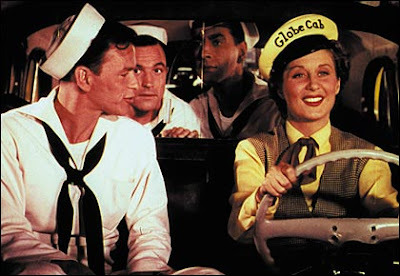 Plus, Joyce Grenfell is beyond hilarious in her one scene. A definite highlight in the film. Now, unto the controversial scene.... SPOILER ALERT!!!!!! I personally think Hitchcock was absolutely brilliant in putting the false flashback in! Hitchcock was forever experimenting and trying new things. He gave an amazing surprise to audiences then and now! Those who say it was an error are completely wrong! It was fascinating. 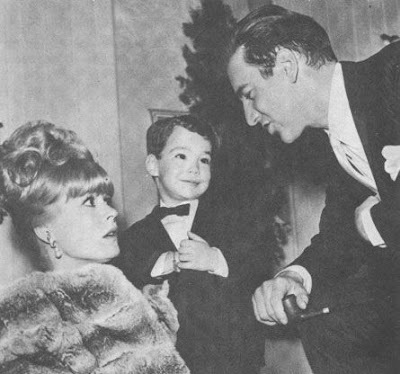 It was Richard Todd's side of the story. He was mentally unstable. 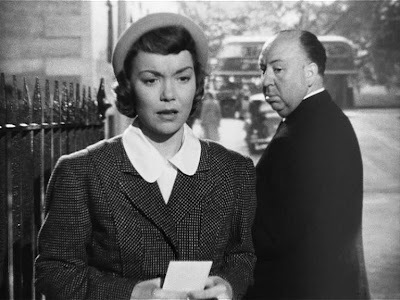 Hitchcock even gives hints about his sanity (or lack thereof) throughout the film. And the shrewd viewer can easily discern them. Sadly, Hitchcock himself thought that the false flashback was his #2 career mistake (following the bomb and child in Sabotage). I think it was amazing. I think that Hitchcock was amazing. Period. And that is what I will be saying until the day I die. 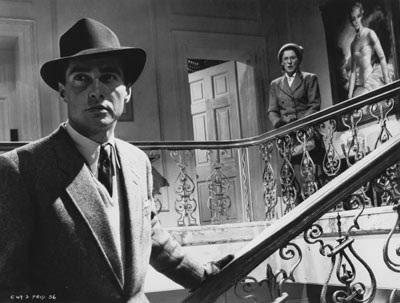 Jane and Richard, in what I think was her best scene in of the film. It was also beautifully shot by Mr. Hitchcock! 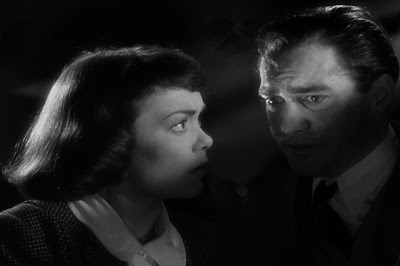 Richard Todd and Kay Walsh. Love this movie and I totally recommend it! Hey, guys, so Raquelle had a great idea: to do themes in my Photo of the Day series. This first week my theme is going to be Umbrellas! Every day I will feature a different star and an umbrella...enjoy! 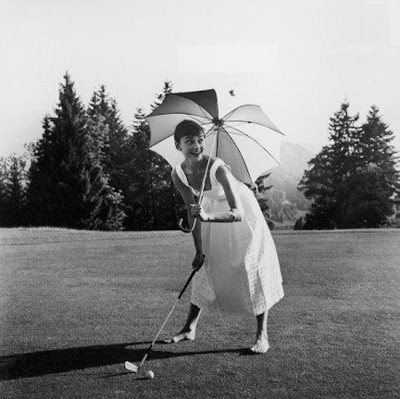 To break the ice: Audrey Hepburn golfing barefoot, while holding an umbrella. I hope I haven't posted this before! But, if I have, oh well....this photo is too loverly! 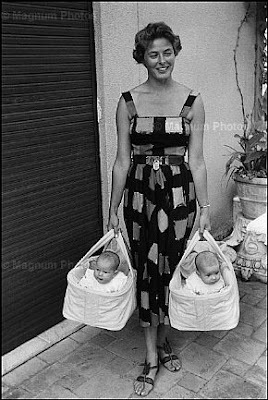 Ingrid Bergman and twins, Isabella and Isotta. BTW, guys, I am so in a Photo of the Day rut! I need to know what you want! If there is anybody or anything you would like to see...please let me know! 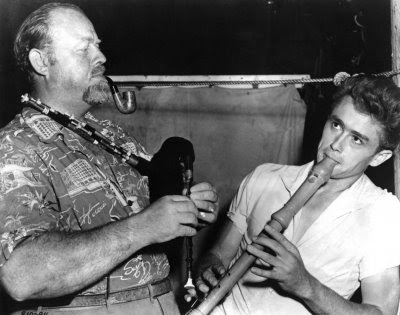 James Dean and Burl Ives on the set of East Of Eden. 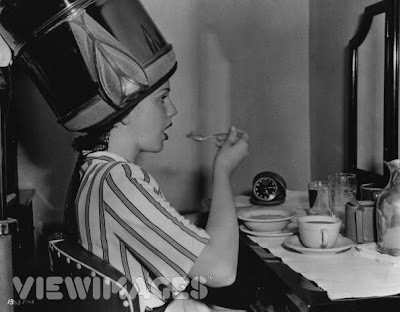 Deanna Durbin grabbing a snack on the set. 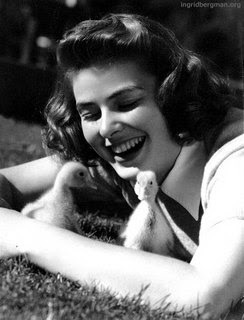 Ingrid Bergman and some ducklings. I wish spring was here...where I live! Betty Grable! 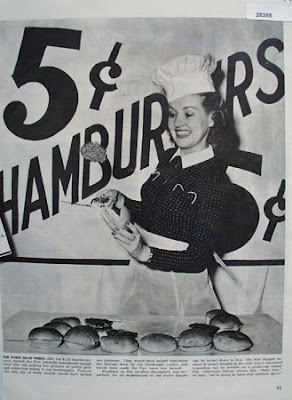 Shown here selling 5 cent hamburgers to help the war effort. How about Bobby Darin AND Sandra Dee? Also their son Dodd. This was taken at Bobby's opening at the Copa. Dana Andrews being mobbed by dozens of screaming Hollywood High School students. 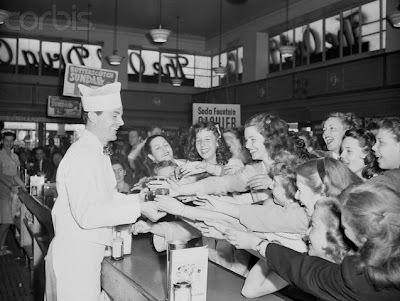 He took a job at a soda fountain to bring more realism to his role in The Best Years Of Our Lives. But, they knew who he really was. Thanks guys for the great suggestions! This is the 50th Photo of the Day! And to commemorate this special occasion I will post three pictures. The first three stars (by three separate users) to be named in the comments below will be the subjects for today's Photo(s) of the Day. 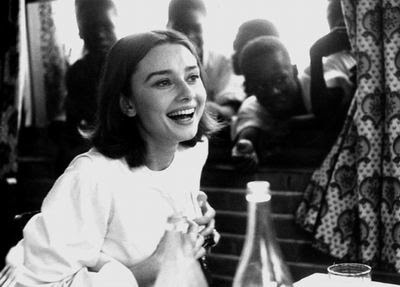 An adorable Audrey Hepburn to brighten one's day! The results to my poll "Your Favorite?" are here. 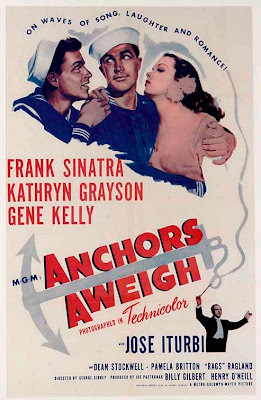 In third place with 3 votes was Anchors Aweigh. 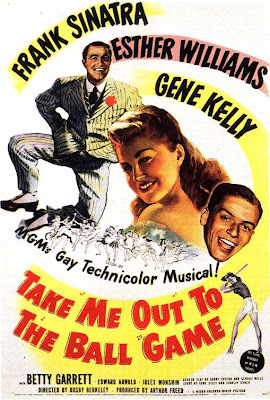 In second place with 4 votes was Take Me Out To The Ball Game (I swear that title is a pain to write...too many words..;-D). 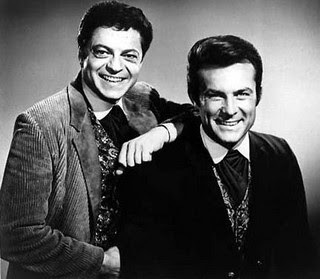 Frank and Gene with Jules Munshin. 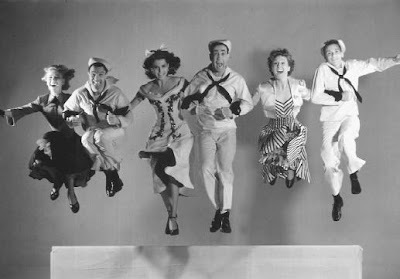 L-R Vera Ellen, Gene Kelly, Ann Miller, Jules Munshin, Betty Garret, and Frank Sinatra. Notice the resemblance? Ann does. I seriously adore all these films, but "OTT" I adore just a little bit more. Anyways, thanks for voting and do vote on my next poll! 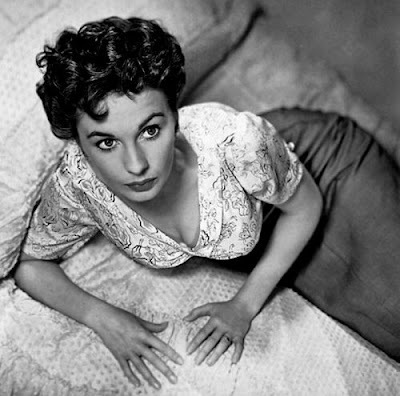 Jean Simmons looking especially beautiful! 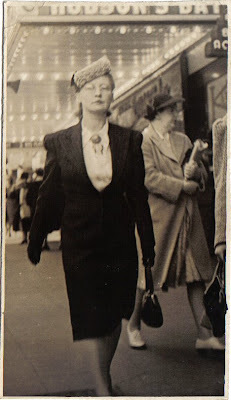 Not a movie star, but my Great-Grandma (differing from my Grandma who has appeared in these pages before) looking oh-so-forties...in the forties. And really this photo doesn't do her justice! As she was absolutely beautiful. 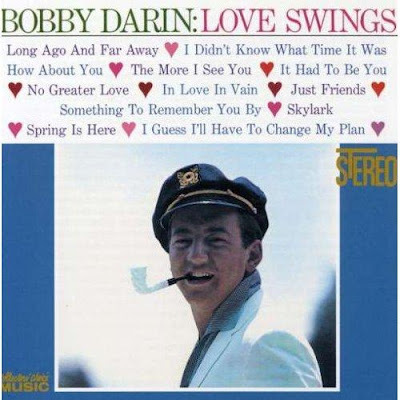 Bobby Darin was known for twisting and tweaking songs...especially lyrics. Here is a great example! It is from his excellent album, Love Swings. I j'adore this song! "How About You?" 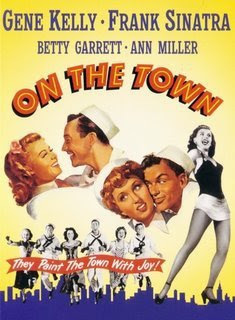 was originally written by Ralph Freed & Burton Lane for the film Babes On Broadway. when a storm is due. Kinda give me a thrill. Ava Gardner looking gorgeous...as always! 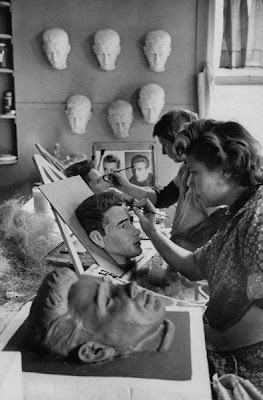 The Warner Brothers staff making reproductions of James Dean's head for selling. 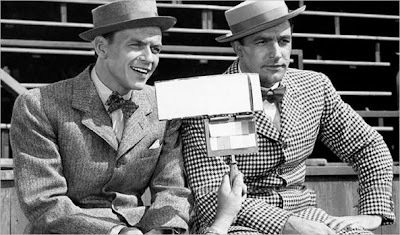 This is the first in a six (or seven...whatever I'm feeling like) part series honoring some of my favorites in classic TV. Hey, terribly sorry guys that I have not posted yet in March! My poor lungs were dying of sickness (I have asthma)! But, now I'm feeling much better and am ready to type. 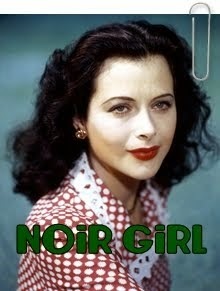 I may have to extend this Semi-National holiday that I have declared into April, considering all I am hoping to cover. Watch the The famous opening credits. 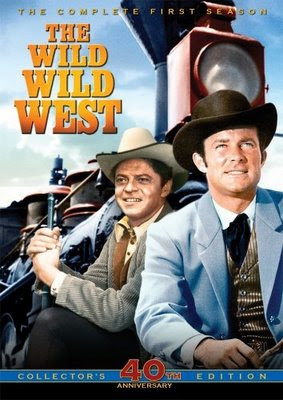 Wild, Wild West (1965-69) is a completely stupendous show starring the amazing Robert Conrad (as James West) and the brilliant Ross Martin (as Artemus Gordon). It has been described as James Bond on horseback and it is a fitting analogy. 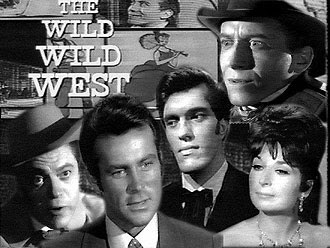 Except James T. West is WAY cooler than James Bond (there, I said it). This show is so amazing I can barely express my love for it. I have seen every single episode many times and my family owns all four seasons. 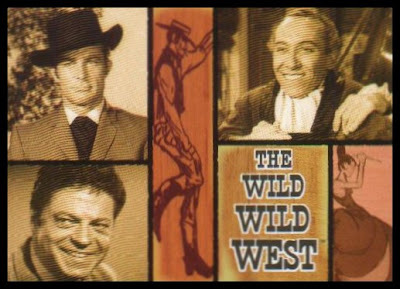 The premise of the show is this: [Captain] James T. West is secret service agent who gets his orders straight from President Grant. He travels around on a private train (the Wanderer 1) with his fellow agent Artemus Gordon. They fight crazy villains, stop fiendish plots to take over the world, and generally keep the peace throughout the country (and around the world)...all for the service of their country and President. And they do this all, with cool gadgets and an unending sense of humor. Oh, they also have two homing pigeons named Henrietta and Annabella. Jim is the "ultimate" suave ladies man. And he always gets his girl (except for a few instances, which cause Artie no end of joy). He also carries about a trillion hidden weapons on his person (in one episode, after knocking out Jim and discovering all the hidden gadgets, one villain comments, "It's a wonder he doesn't clank when he walks"). Jim also is a masterly fighter, taking on five or ten men easily. Artie is genius-like. He invents all of Jim's gadgets and often times tests chemicals and such to find out info they need. More importantly he is a master of disguises (seriously Ross Martin was BRILLIANT)! He can be anything and anyone, with his many costumes, fake hair pieces, and clever accents. Artie isn't necessarily the greatest fighter (often finding himself knocked-out when it comes to blows) but he doesn't need it. He has too many invented gadgets and weapons to fool around with physical fighting. Although, he's always there if Jim needs him...usually with a new gadget...he hopes works. 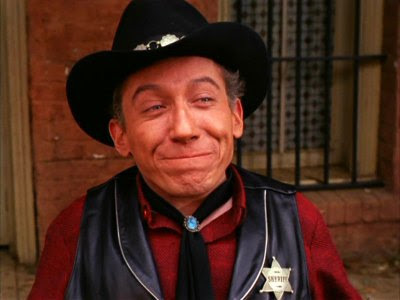 Dr. Miguelito Loveless is the one villain Jim and Artie cannot conquer. He is a recurring enemy throughout the seasons. He is the little man with the rage against the universe. Dr. Loveless is a dwarf-sized man, who also happens to be a genius. He has a twisted little mind, that is strangely capable of gentleness. When we first meet him, all he wants is Baja California...back (he claims his ancestors used to own it), so he can start a retreat and school for children. Soon he abandons the children idea...he just wants the land. And finally after being outwitted too many times, all he wants is to see Jim and Artie...DEAD! We watch his downward spiral throughout the ten episodes he appears in. In this all Michael Dunn is masterful in portraying him. He is layered and complex. Always has a new plan and an outrageous invention, coupled with massive wit (only undermined when Jim and Artie ignore him...that always infuriates him...and J&A know that). And plus Dr. Loveless can NEVER die. It's a proven fact. Was nominated for three Emmys. 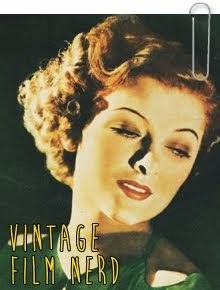 Won one (for Agnes Moorehead's performance in "The Night of the Vicious Valentine"). Was canceled after four seasons, NOT because of bad ratings (quite the contrary)! CBS was forced to cancel it after being pressured about too much violence on TV (LOL, this show is NOT that violent)! Feel free to skip this section...it's rather long! This episode is the pilot...and boy, is it a great pilot! It has twists and turns never thought possible. And you have one of the few ladies that can handle and stand up to Mr. West...Suzanne Pleshette. I love this episode. It has a great prop in the "deadly bed" and a delightful leading lady (Barbara Luna) who successfully knocks Jim out...quite a feat, considering he can take on ten men at once and still win. The first appearance of Dr. Loveless. He has plan about blowing San Francisco...or something minuscule like that (minuscule in Loveless' terms). He is joined by his sometime companions: Voltaire and Antoinette. Jim and Artie must rescue a gorgeous kidnapped princess before it's too late. Also Jim comes up against a most skilled fighter in a test for his life. On of my top five picks (of all seasons)! 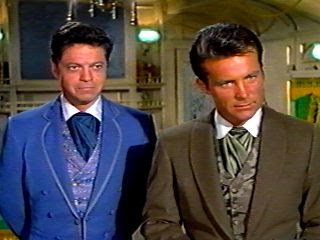 Dr. Loveless creates a body-double of Jim...code name Janus. It is really funny watching Artie try and figure it out, when they are both there. Also this episode marks the first mention of Artie's Great-Aunt Maude (forever in Artie's memory). Be wary of politicians...it might not really be them, but actors posing as them. Artie gives a simply hilarious performance pretending to be a French painting expert. 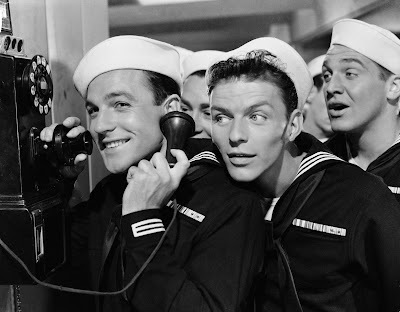 Jim and Artie rescue a Chinese Princess several times (she keeps getting taken away from them), as two different Opium smuggling gangs try to keep her off the boat to home. HILARIOUS! This Emir likes being kidnapped. Jim and Artie must keep him safe, as they stumble unto an assassins club...for fun they kill. 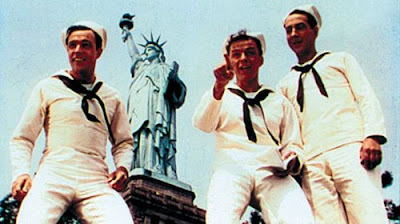 Nick Adams gives a shattering performance as an extremely flamboyant South Seas prince on a visit to America. Simply wonderful episode. A fascinating episode. About speed and just how fast one can go. 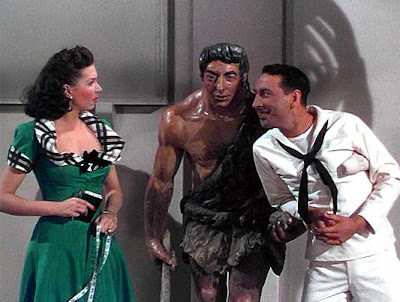 Artie has a wonderful costume in this one too. Another one of those "assassins clubesque" episodes. A great cast of motley villains. Dr. Loveless is back. With a plan to shrink the rest of the world shorter than him, no less! A green-skinned lady steps out of a spaceship...would you believe her? Jim has ways of finding out though. And Artie is plenty busy doing some jewel analyzing. Dr. Loveless thinks himself Robin Hood and has succeeded in getting an entire forest killed off. The tag scene is AMAZING. I don't want to give away any spoilers though. An incredible and fascinating episode about a house that is alive. Jim kills Artie! But, who's that presiding over Artie's funeral? Jim has met another female match in the form of a headstrong gypsy. Who NEEDS an elephant for her circus. One of my other top five episodes. It also won Agnes Moorehead an Emmy for acting. A delicious episode about a matchmaker gone wrong. Another Dr. Loveless. 'Nuff said. Ooh, a great and spooky episode. 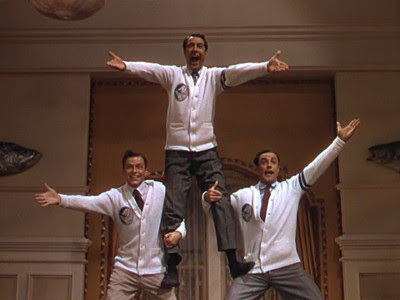 Joseph Campanella is superb. Don't worry I already told you he couldn't die! A delightful episode with Frank Silvera switching back and forth between sides. At the end one is not really sure if he's on Jim & Artie's side or not. Great banter between characters...as always. A bizarre, but strangely enjoyable episode. You will have to see it to believe it. Jim isn't on the side of the law anymore. He's gone bad and resigned. Jim has amnesia and can't remember who he is or anything. One of the better episodes. Just how far will a prominent family go to cover up the skeletons in the closet? OMG, This episode has Artie's funniest costume ever. I laugh out loud every time I watch. 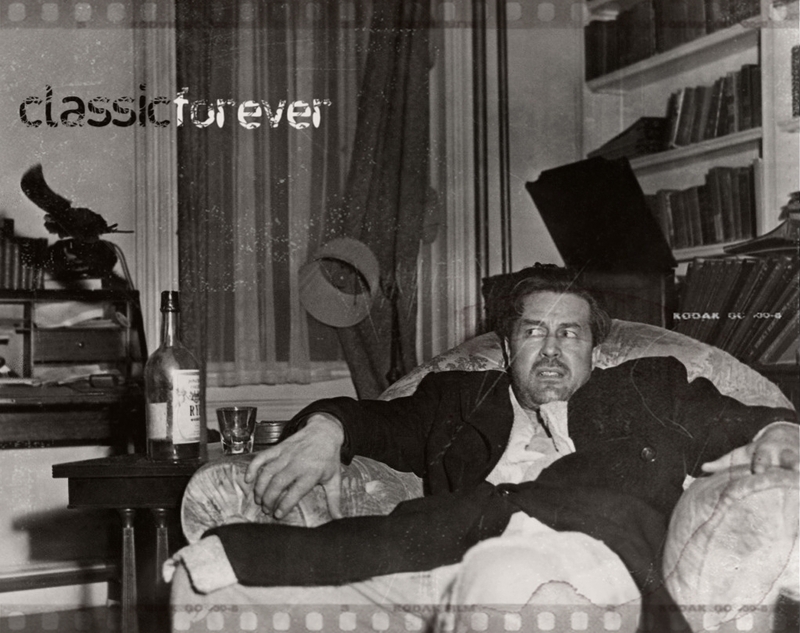 An old billionaire delights in playing twisted and deadly parlor games with his famous guests. This one was included simply because it has a hilarious Gilligan's Island inside joke (both Alan Hale and Jim Backus appear in this). Artie has an amazing costume and the divas...are well...divas! A great whodunit, with Hitchcock's main character actor John Williams along for the ride. 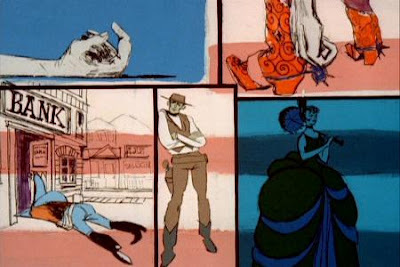 The final episode broadcast. It has deliciously annoying brat that one loves to hate in it! Those were some of my favorites, but really you should check out every episode as they are all magnificent! Jim: It wasn't your money. Lydia: It was... until you made me give it back. Artie: Did it ever occur to you that red might mean danger? For instance, red for fire, fire of explosion? Jim: What would they want to explode? Artie: People who fool around with their levers. Emma Valentine: Your ideal mate, Mr. West, is a combination of Aphrodite, Helen of Troy and Lola Montez. Oh, Mr. West, I'm afraid it can't be done. Jim: Well, frankly I like to do my own shopping anyway. Jim: Artie, if you keep stealing my girlfriends you're going to end up dead again. Jim: Artie you couldn't be quiet, not even at your own funeral, could you? Artie: Well, somebody had to tell the truth. Jim: Bombs are like women, gentlemen: you should never let them know you don't trust them. Count Manzeppi: Mr. West! You have succeeded in making me lose my temper! Count Manzeppi: For you it will be highly traumatic. Jim: Did I hear big mouth correctly? Artie: Yup. They're going to hang you and take me with them. No hard feelings, Jim. Artie: I didn't know you liked toys. Jim: Where are we roughly? Artie: I'd say about five minutes away from dying of thirst or alkali poisoing. Dr. Loveless: You, Mr. Gordon. You didn't play fair! You cheated. Artie: A weakness. So sue me! 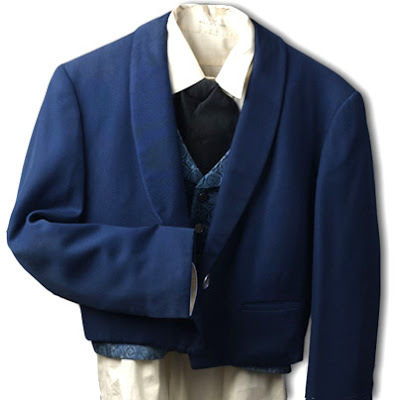 Jim's famous suit-coat. You too can own it for only $8,000. Oh, and check out this thread in the TCM forum. There are some great insights by many people. I am ILoveRayMilland. Thanks for reading and sorry about the wordiness! 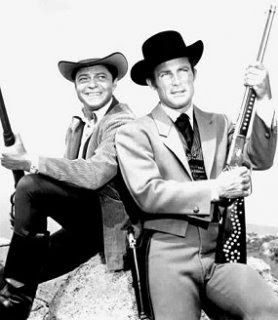 Join me next time for a (hopefully) much shorter post about another classic TV show! 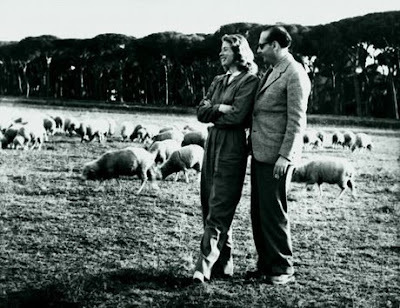 Ingrid Bergman (looking gorgeous as always) and Robert Rossellini. Doris Day and six colorful poodles! 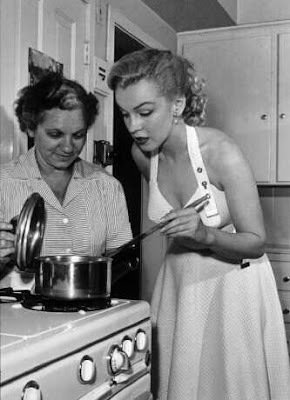 Marilyn Monroe...cooking up something good, while wearing an absolutely adorable dress. James Dean is easily amused!